In previous sections we explained the basic roulette computer algorithm which is used by almost every roulette computer. Again, like visual ballistics, they simply determine which number is under the reference diamond when the ball is predicted to fall. Visual ballistics doesn't usually use "timings" as such, but it doesn't need to because the time it takes for the ball to do its last 4 revolutions is much the same on any different spin. So with this very simplistic approach, we are assuming the ball will decelerate at the same rate on different spins. Does it actually? . . . No. The reality is roulette is a very dynamic game. The physical properties of the wheel and ball gradually change over time. For example, the ball track may gather some dust or grit. The ball may develop a coating of sweat, oil or dust from the dealer's fingers. The air pressure in the casino will vary over time, thereby affecting the deceleration rate of the ball. 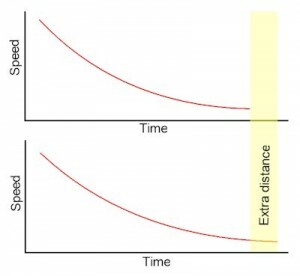 This all means that over time, the ball's deceleration rate can and will change. 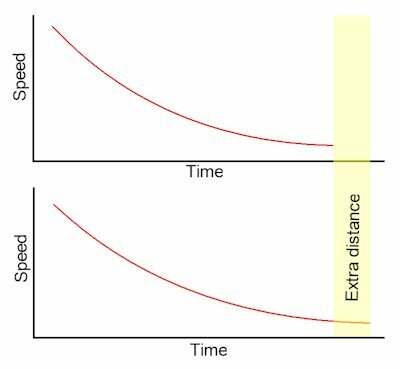 And if you incorrectly assume the deceleration rate will stay the same, as time progresses, predictions will become less accurate. Every roulette computer from other vendors we've tested makes the same incorrect assumption that the ball deceleration rate will stay the same. Or from a simplistic perspective, that when the ball reaches 1300MS per revolution, that it will always have 7 revolutions remaining. Later versions of some computers have attempted to "patch" the flaw with additional algorithms, but instead have created other problems. The only roulette computers that correctly adjust for ball deceleration rate changes are our Uber and Hybrid versions. Let's assume you begin roulette computer application with a perfect model of the ball's deceleration rate, and that you can accurately determine how many revolutions remain for the ball once it passes a certain threshold speed. Now you start collecting data, writing down the reference number and winning number (A,B) as explained in previous pages here. After about 2 hours, you will have about 30 spins for each direction. With the basic "visual ballistics approach": The ball completes perhaps 1 revolution more or 1 revolution less than it did before. This means your betting area will be roughly 9-12 pockets off target, and instead of your bets targeting the correct area, they avoid it. So you have gone from a strong win, to a strong loss. The end result is you have either no edge at all (random results), or lose even more than you would with random bet selection. If you do not account for ball deceleration changes and attempt to determine the range of ball speeds that result in the ball hitting a specific diamond: It is simply not possible because the smallest variations of ball deceleration rate changes completely change which diamond will be hit. Your result can only be accurate in the short term while the ball's deceleration rate remains consistent. After even a slight change, you lose all accuracy, or even end up avoiding the winning sectors. Above is a chart showing how a very slight variation in ball deceleration rates will affect the overall ball travel distance. The difference is completely in perceivable to the naked eye, but in this case is the equivalent of 2 ball revolutions the difference. This is common ball behavior and unless the computer adjusts for the variations properly, full accuracy cannot be achieved. Additionally, the failure eventually leads the player to bet in areas that avoid the correct wheel sector. In most cases, the deviation is over 1 whole revolution. This typically halves the player's edge. A full revolution of error is easy enough to notice if you're paying attention. But much more subtle changes to ball deceleration occur constantly. And unless the computer dynamically adjusts for these smaller deviations, it is impossible for the computer to maintain accuracy in predicting which diamond the ball will hit. And such a capability is critical to minimize ball scatter. The difference can be either having an edge of +2% or +30%. That's a 1500% difference in accuracy.